I will always love you my angel friend and you will always be in mine and many other's heart it will always be a blessing to me that God brought us together here and this is my tribute to you and the friendship we shared within my heart I carry that friendship where ever I go. You are now home my angel friend with our Father above where angel's belong may your spirit of friendship and love always be within me until we meet again one day my sister I will always love you. I wrote this a while back and I just wanted to repost this for our sweet angel friend and sister Beverly for we have shared many moments of friendship together here at nethugs and It's still hard because we e-mailed each other alot I still have some of her e-mails and I still read them. I know she is above watching over us all and my heart is sad for her loss God needed her to come home and now she has finally gotten the most beautiful wings so she kind keep up with all of us. the thought of this makes me happy because she will always be in our hearts forever. of her friends the most beautiful e-mail. Thank you for re-posting this beautiful write for her. It is great to know that she is not forgotten! Thank you sweet Jan for your kindness and for your friendship you are a very special person to alot of us here at nethugs and I know God is with each one of us as we miss our angel friend and her beautiful poetry that she has shared with many of us here at nethugs. This is so Beautiful! I know Beverly is smiling down at you knowing her love and kindness will carry on through everyone who knew her and loved her. And you are one of those very special friends who keeps her love alive! 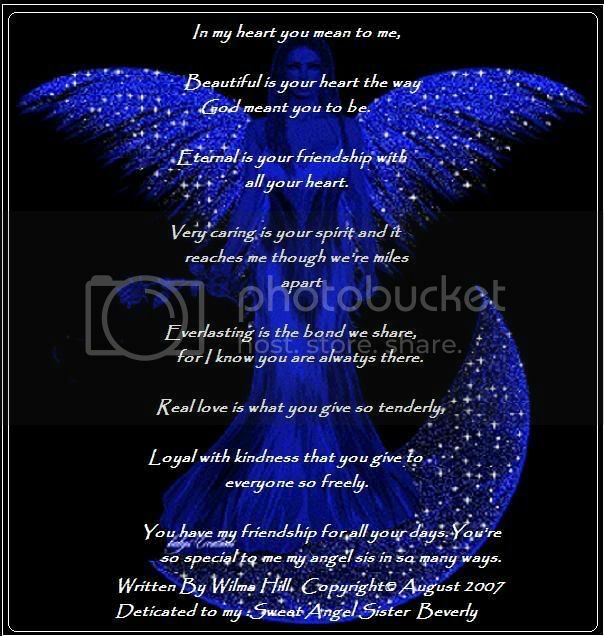 Thank you so much Eva you have a kind heart and loving spirit and I am glad you stop by to read this for Beverly angel yes we will always love her and miss her she was a wonderful poet and net sis and friend to many of us here. Thanks for your beautiful comment.